According to mushroom quotation provided by Hubei Baishazhou Agricultural & Sideline Products Market, on April 9, King oyster mushroom, Enoki mushroom, Agrocybe cylindracea, Brown Shimeji mushroom, Shiitake mushroom and Oyster mushroom are 6 varieties that show price rise. 1. Price of King oyster mushroom has risen from 7 to 8 CNY per kg, indicating 14% of increase range. 2. Price of Enoki mushroom has risen from 5.3 to 6 CNY per kg, indicating 13% of increase range. 3. Price of Agrocybe cylindracea has risen from 8.5 to 9 CNY per kg, indicating 6% of increase range. 4. Price of Brown Shimeji mushroom has risen from 14.2 to 15 CNY per kg, indicating 6% of increase range. 5. Price of Shiitake mushroom has risen from 8 to 14 CNY per kg, indicating 75% of increase range. 6. Price of Oyster mushroom has risen from 2 to 9 CNY per kg, indicating 350% of increase range. On the contrary, by April 9, Seafood mushroom, Superior Shiitake mushroom and Stropharia rugosoannulata are 3 varieties that show price fall. 1. Price of Seafood mushroom has dropped from 11.7 to 9 CNY per kg, indicating 23% of decline range. 2. Price of Superior Shiitake mushroom has dropped from 17 to 16 CNY per kg, indicating 6% of decline range. 3. Price of Stropharia rugosoannulata has dropped from 20 to 15 CNY per kg, indicating 25% of decline range. “Price of White beech mushroom, Button mushroom and Black fungus is respectively at 15 CNY, 14 CNY and 8 CNY per kg. 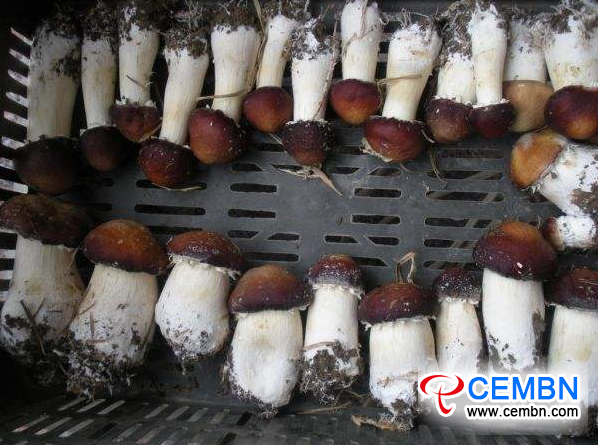 From April, mushroom price shows an overall upward trend in our market, which is in relation to its source,” introduces manager of Hubei Baishazhou Agricultural & Sideline Products Market passionately.